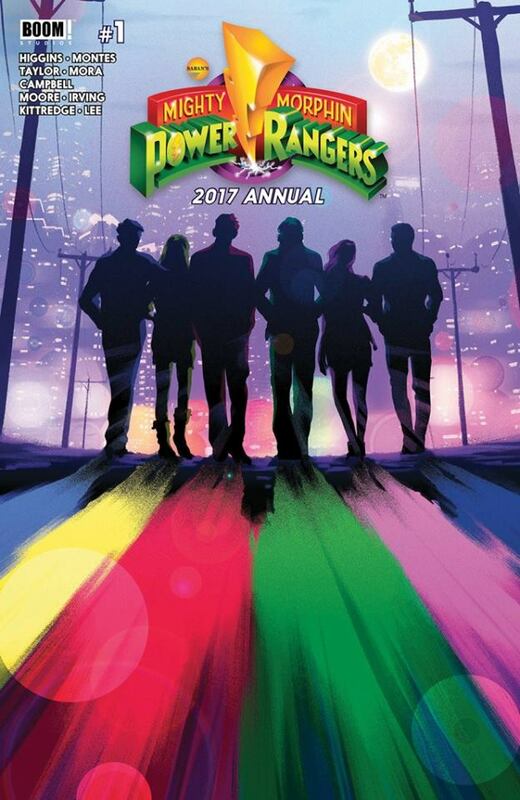 Mighty Morphin Power Rangers 2017 Annual Review – AiPT! Mighty Morphin Power Rangers 2017 Annual is a fantastic issue that takes a step back into the Lord Drakkon universe without taking anything away from the actual story. We get to see more story about the Rangers, specifically Zack and Trini before Tommy had joined forces with Rita regardless of her evil spell on him being broken. Tommy is the star of Power Rangers and has always been seen front and center, but since this issue takes place before Tommy took the name Lord Drakkon and joined Rita to take over Angel Grove, the spotlight shifted to a couple other Rangers and one of them is none other than Trini Kwan. Trini has always felt like a side character to fans because Kimberly Hart was the female lead in the spotlight leaving Trini to be the supportive role. Tom Taylor did fans of Trini proud by giving her her own chapter to explore her personal side and actually get to know Trini with no other Rangers stealing the spotlight. Trini brings tons of humor and action that readers can enjoy. Zack Taylor also gets his own chapter which feels necessary since he’s leading the resistance in the other world where Lord Drakkon had taken over. After reading this chapter I found myself in excited disbelief because this issue feels like it was written for the fans and not just another issue that was rushed due to a deadline. There’s just so much eye candy for Ranger fans in this chapter with sweet unexpected cameos and action. This story about the other world is most definitely a Tommy story but it’s nice to see that he plays such a small part and the real stars of this story are Zack, Trini, and Billy. In the little we see of Tommy, he shares a very moving conversation with Rita and we get to see a little tease about how he gets the name “Lord Drakkon”. Not a lot of Tommy, but it was more than enough since Tommy is usually the center of the Power Rangers universe. Going into this issue I was a little skeptical because we’ve all been eagerly awaiting to read Power Rangers issue #16, but this issue is a definite must read. The art through all five stories is breathtaking; the visuals are the best part about this issue. You actually get to enjoy these books more than the television show because so much more can be done and not look so cheesy. There’s nothing bad to say about this book, especially after seeing the additional elements that were brought to this book that bring you back to 1995. I don't know what they're putting in the coffee at BOOM! Studios, but keep it coming. Mighty Morphin Power Rangers Annual is eye candy for all Power Rangers fans. The best part of the Power Rangers comics so far has been the ability to play with other characters outside the original six and this issue nails that. Seeing Trini finally get a chapter to herself was the best part of this book and almost the series at this point.